These meatballs have a secret and it's in the sauce! 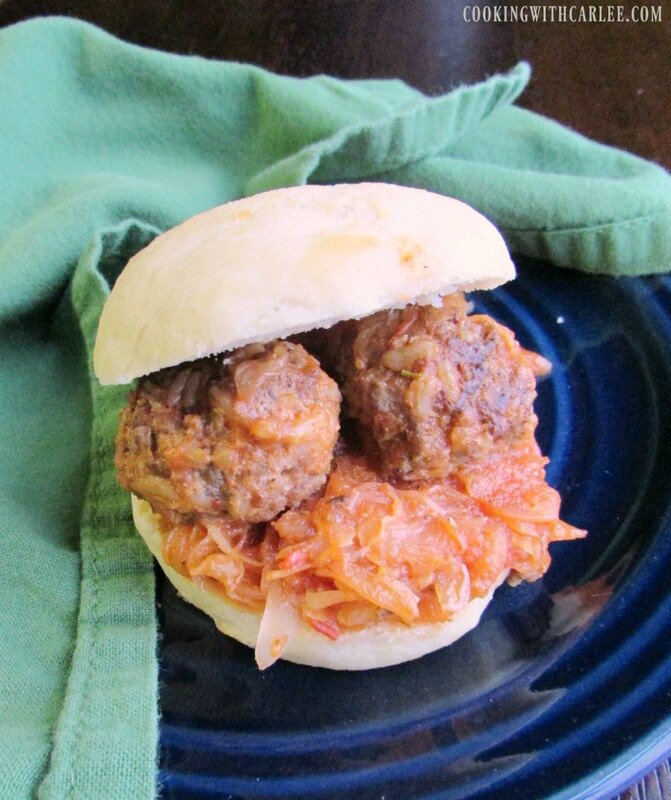 Porcupine meatballs make great for great sandwiches and sliders! Can you keep a secret? I mean something that is just between you and me, nobody else can know? Are you ready? 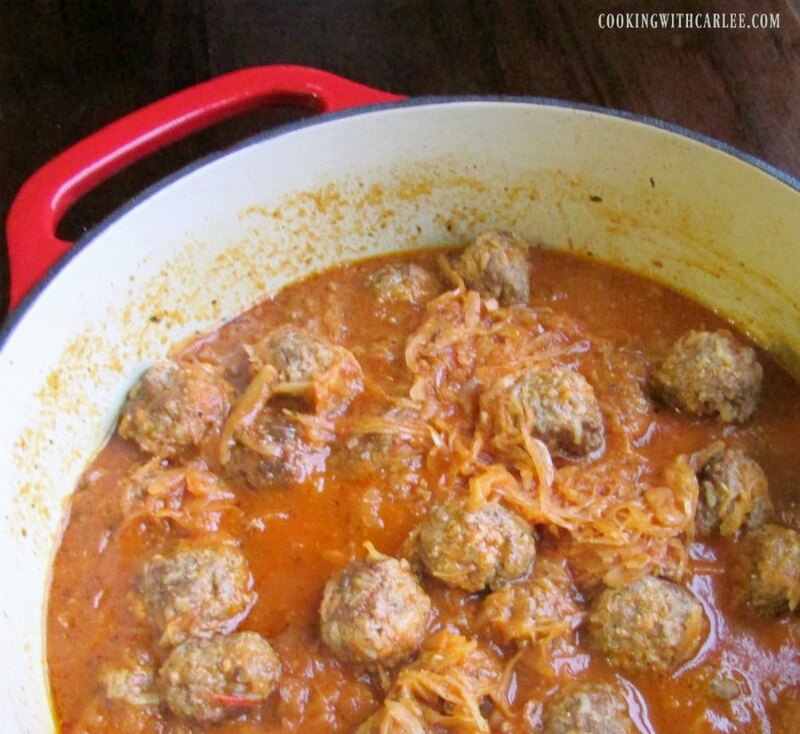 These meatballs are cooked in sauerkraut. SHHHHHHHHHHHHHH! Not so loud! My husband might hear you! Why is it such a secret? Because he HATES sauerkraut. I mean hates it. And these little gems are cooked right in it. And he ate them!! No, really, he did! Do you want to know the best part? A couple of nights later we were having a dinner with bean sprouts in it. He quizzically poked at one before he took another bite. "What are these stringy things?" he asked. "Bean sprouts?" (of course!) "Is that the same thing that was in the meatballs the other night?" Yep, he really didn't know! And you and I are certainly not going to be the ones to tell him, are we? Why ruin a perfectly good thing? My good friend Diane gave me this recipe a while back and I just now finally got around to giving it a try. I knew they would be good, as everything she has ever shared with me has been, but to tell you the truth the kraut caught me a bit off guard too. She says her son love the meatballs, but hates kraut. So you know what she does? She chops it real fine and throws it in anyway. He gobbles them up! I don't blame him, they are really good! She serves them on her soft Buttery Potato Rolls, so I had to do the same. I highly recommend the combination! You really can't taste the sauerkraut at all. It just gives the sauce that little something extra both in flavor and texture. If you need to hide it a little better though, go ahead and chop it up! Whatever it takes to get the job done, you know how it is! If your family loves flavorful sandwiches, you may also like maid rites or loose meat sandwiches. Have you have tried those? You should! My friend Di shared this recipe with me and it's a winner! 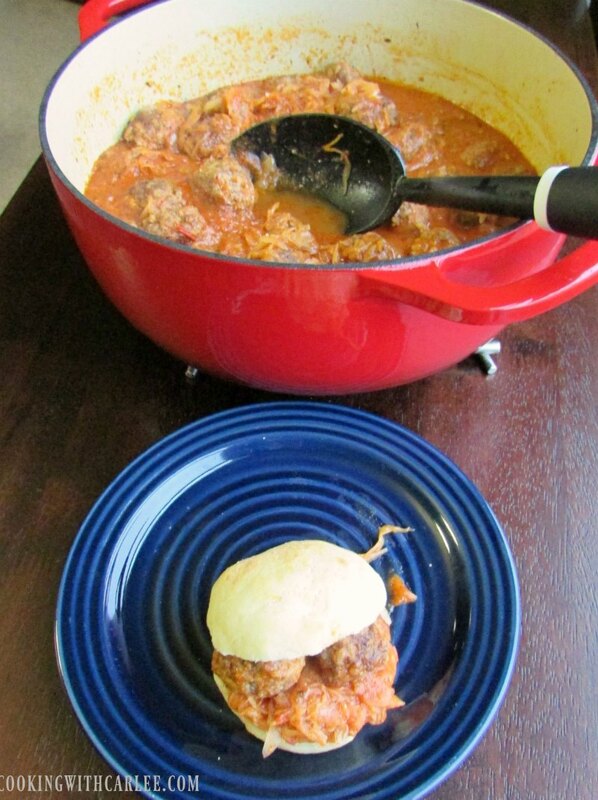 The meatballs are simmered in a flavorful sauce and make excellent sandwiches! Mix together onion, beef, garlic, eggs, rice, salt and pepper in a big mixing bowl until just combined. You don't want to overwork the meat. Gently roll into golf ball sized balls and place on a cooking sheet. In a large dutch oven, heat the cooking oil over medium heat. Working in batches, brown all sides of the meatballs then remove from the pan. Once all of the meatballs have been brown, drain the grease. Add the tomatoes and tomato sauce, scraping any browned bits off the bottom of the pan. Stir in the drained sauerkraut and Italian seasoning. Gently nestle the meatballs in the sauce. It is ok if there doesn't seem to be enough sauce at this point, it will all come together. Cover and cook over medium low for about 25 minute or until the meatballs are cooked through. Labels: apps and snacks, Beef, Dinner, Family Favorites, Football! Since we are to have more weeks of winter there will be plenty of time for this dish. It is definitely a perfect dinner after a cold day! Thanks, Linda! Di rocks it again and I love this lil secret!!! Sauerkraut for the win! She always does, doesn't she?! Yum! I absolutely have to try this recipe! And, I won't tell your husband if you don't tell mine, since apparently they also have sauerkraut in common! What an interesting combination, I can't wait to taste this recipe! I really appreciate you sharing with us at Full Plate Thursday, hope you have a great day and hope to see you again soon! My husband loves sauerkraut, me not so much. I will try this though, I just won't have the benefit of "not knowing" like your husband did. I bet it's delicious! Thanks for sharing at the Family Joy Blog Link Party this week! Please join us again next week. It is easier if you aren't trying to pull one over on yourself! ;-) I was surprised how eagerly he ate them and definitely giggle to myself when he honestly didn't know what he had eaten a few days later. I hope you love them! I'm not a huge fan of meatballs, it has to do with the sauce I think. Not flavorful enough. Odd since I love meatloaf. But I think that the sauerkraut might be what I'm missing, would give the sauce a bit of vinegar flavor, which I love on meat! Thank Di for me, I think this is a winner! There is definitely a lot of flavor in these! I know what you're saying though, some meatballs can be a bit bland. You'll have to let me know what you think! This looks good! Thank you for sharing this with us @FuntasticFriday!